What should you look for in a floor scale if you use pallets to transfer merchandise around your warehouse? Arlyn Scales designs and manufactures all of our scales in-house in our factory in New York, so we can customize many aspects of the scales directly. Because there is no middleman at any point of the sale and you are speaking directly with the manufacturer, the customization process would be more accurate, a smoother process and less costly. Feel free to contact us, talk to us about your business and with our over 30 years of experience, we can help you think over what kind of a scale you’ll need and if there are any customizations that may optimize your business in particular. The best way to do this is calling Arlyn Scales on our phone number at: 516-593-4465. 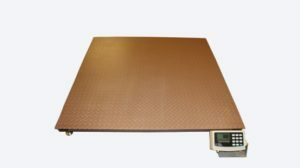 The capacity of our basic floor scales ranges from 1 – 20 tons. To be able to take that in warehouse conditions, you need exceptional materials. Although other companies use aluminum for their scales, steel and stainless steel are the choice of metals for most of our rugged scales. Even our lighter-use scales that are originally fabricated in aluminum can be optionally customized with stainless steel. The load cells are made of stainless steel, which have significant advantages over steel. Steel is widely known for its strength, but stainless steel is also more corrosion resistant, performs well in low temperatures, is easier to clean and all of these benefits lead to less maintenance. This is another factor that you’ll be looking for in a floor scale for weighing pallets. Every bit helps, and with our low-profile scales that can be fitted with a slight ramp, depending on your equipment and manpower, this may speed up your loading and unloading times. Our scales are only 2 7/8 inches off of the ground. At Arlyn Scales we have stayed ahead of the curve on technology. Our indicator consoles can connect with WiFi, USB memory sticks, Ethernet and RS-232. The WiFi capability makes it easy to record and manage information from afar. The scales can operate on optional rechargeable batteries, so the scale doesn’t always have to be connected to an electrical wall socket. To help you maintain your investment, the display can warn of overload condition at 102% of scale capacity. Mechanical stops prevent damage to 150% capacity. You can record tare values, and the display has a net/gross function. With an upgrade to our high-tech, user-friendly touch-screen UpScale Indicator, you can access information easier that will help you analyze and strategize to maximize your profits. It’s time to talk with someone about your needs in your warehouse, and at Arlyn Scales we do not just manufacture and sell the scales, but also have deep industry knowledge of 30 years that can help you discover your best options to advance your business and save you money by purchasing directly. Contact us here or call 516-593-4465.